While eating a liquid-only diet and jogging in sweat suits were once the go-to approach, today’s proven methods of fat loss are much different – and thankfully proven by science. In this guide, we’ll separate fat loss fact from fat loss fiction and highlight 10 of the biggest myths that still seem to find their way into our lives. Trying to figure out the basics of CrossFit on your own can be challenging. 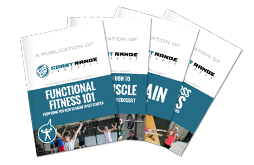 The web is filled with so many conflicting resources on Functional Fitness 101, finding simple answers as to what it is, what it does, who it’s for, and how to do it can be downright disorienting! To help you along the way, we’ve put together this guide Functional Fitness 101: Everything You Need to Know To Get Started. It’s specifically tailored for you -- someone who is new to CrossFit and is looking for just the facts (sans emotional outbursts). We help people get stronger every day. It’s kind of our thing. And from our experience, it’s pretty rare to come across someone who is gaining muscle at their maximum potential. In response to this observation, we’ve taken some FAQs from our friends at Barbell Shrugged, and put them together for you in this handy dandy guide. We’re fairly sure the entire world can be divided into two groups. Those who live their lives with a default posture of shoulders back and head up, or normal people who slouch over steering wheels, laptop screens and smartphones most of the time even though we totally buy into the idea that it’s killing us slowly. Does this sound like you? If you’re not raising your hand in agreement, it’s probably because of poor range of motion, right? C’mon, everyone does it. Download this free guide to learn our tips to easing pain and improving your mobility. TRY Coast Range CrossFit FREE!